With the majority of the VC-17 removed during the prior day, all that was left to do was patch up the spots where we got a little bit too aggressive with the sanding and removed parts of the epoxy barrier coat to expose little white patches of gel-coat. Not a huge problem on our boat’s hull setup (gel-coat–> internal barrier coat–> fiberglass hull), but something that we wanted to address before applying our anti-fouling. 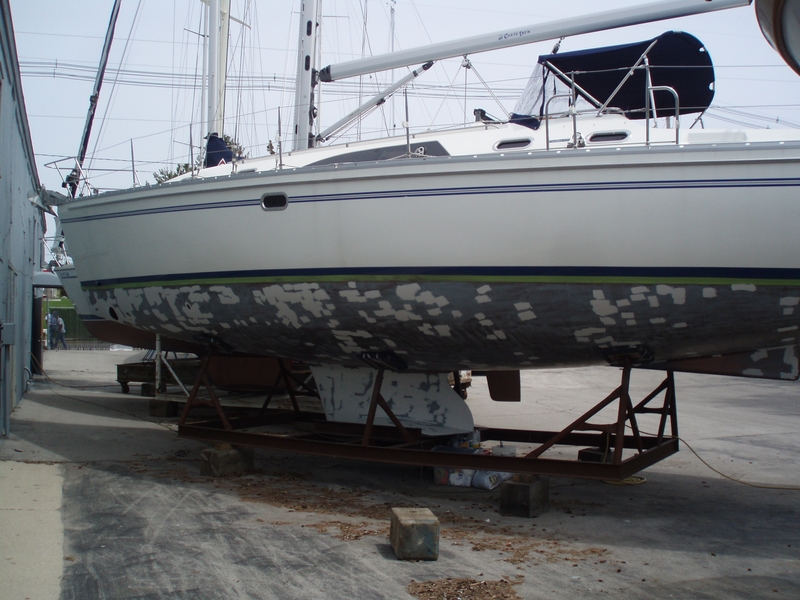 The epoxy barrier coat (Interlux E-2000) that was applied by the marina that Carpe Diem was purchased from was grey in color. Unfortunately, no place in town had E-2000 in grey. So, we had to go with white. Not terrible, but definitely created a patchwork on our bare hull that received many curious looks from the Palmer Johnson crew that is commuting between the parking lot and their boat in progress docked in the yard. Now, it may look like there are a lot of patches. But, rest assured, there were not very many spots where we hit gel-coat. I went a little overboard and covered any light scratches that looked offensive as well. With all the trouble spots addressed with two coats of epoxy primer, it was time to call it a day. Just as we were wrapping up our bottom paint prep work, we got the call from Jenna, my sister, that she had just had her baby. A beautiful, healthy, little girl named Adelyn Jean. So, we packed up all of our things and headed up to Minneapolis to meet my mom, my sister/brother-in-law, and the new baby. The paint was on order anyways and wasn’t anticipated towards the end of the week. So, we had some time to spare.